Gollancz has opted to not use the Michael Komarck art from the Pyr edition of Shadow's Son much to my chagrin. When I first saw this version I knew it was a Chris McGrath piece just based off the color tones and position. It is a decent piece, but I prefer the US version. The blue of the tag line and the arrows feathers just seem out of place and the title treatment tries a little too hard to hammer home the shadow theme. But whether you go with the US or UK version it is what is between the pages that matters, which in this case is a very action packed Sword & Sorcery tale. Either way debut author Sprunk can't be disappointed that both his publishers sought the services of two top level illustrators, which in and of itself shows their hopes for him. 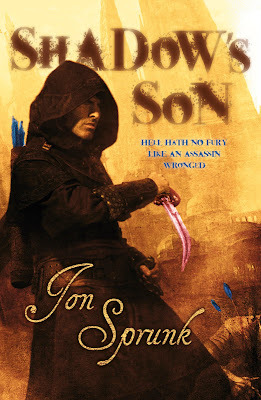 Shadow's Son is now available in the US with the UK edition coming out July 1st. This is some great cover art. I love how the blue feathers on the arrows jump out at you along with the red of the knife blade. But I think I like the US cover better with Kit on the front. I love both covers. And like you said, Mad, I'm thrilled the publishers brought in such awesome artists for my book.